From cannabis to cocaine, How to choose and buy the most reliable drug test kits in 2019. Test your stuff for identification, purity, and cuts. More and more these days, drugs are being cut with various substances. Some of them are harmless, simply meant to add weight or mimic the appearance of the actual drug. Others aren’t so safe and can make you sick…or worse. Before you ingest something, it’s important to know what you’re putting into your body. This can prevent you from having a really bad experience…and can even save your life. But how can you possibly know what’s in that pill or baggie without sending it off to a lab? With the portable drug testing technology available in 2019, there’s no reason for that. With drug test kits, you can easily find out at home. What Are Drug Test Kits and How Do They Work? When you buy a drug test kit, you harness the power of knowing exactly what’s in a substance before you swallow it, smoke it, or snort it. It only takes one slipup to make someone incredibly ill or even kill them. When you’re not comfortable relying on the word of someone else—especially if that someone is the person you purchased the product from—drug test kits can give you real peace of mind. These days, drug testing kits are fairly straightforward and easy to use. For the majority of them, you’ll simply break open the ampoule included in the package. The test kit chemicals are already inside. Place a small sample of your substance inside the ampoule, close it, and shake it up. You’ll then be able to compare the color of the liquid inside to the results indicated on the included color chart. Depending on what type of test you get, the results will reveal one of two things. They’ll either let you know whether or not the material you have tests positive for a particular substance (“Does this pill really contain ecstasy?”) or they’ll let you know the purity of the substance in question (“Has this ‘cocaine’ been cut with something else?”). Before purchasing, you need to be clear on whether or not you would like to test a substance for the presence of a particular drug or chemical (like THC) or if you’d like to determine whether a particular substance has been mixed with something else to make it heavier. A third type of at-home drug test kit specifically deals with cannabis. These will reveal the cannabinoids present in various strains of marijuana. Do you have a strain that’s supposed to be low in THC but incredibly high in CBD? An at-home cannabis test kit will let you know for sure. What’s the best drug test kit to purchase? When choosing one, it’s important to buy from manufacturers that are reliable and reputable. The two best-known drug test kit brands are Test Kit Plus and Alpha Cat. Here’s the basic rundown on each. Harm reduction has always been the goal of the founders of Test Kit Plus. They realized that most drug users are recreational users. Plenty of online videos show how easy it is to fool individuals by creating counterfeit pills at home. By creating their line of drug test kits, Test Kit Plus hoped to save lives by allowing people to educate themselves in order to make informed choices about what they put in their bodies. Test Kit Plus has a variety of clients that range from private individuals to government agencies, medical centers and harm reduction organizations. 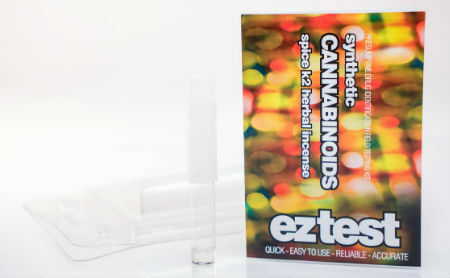 Like EZ Test Kits, their drug testing kits offer options that test for the presence of specific ingredients (such as THC or opiates), as well as ones that test for drug purity. The factor that differentiates Test Kit Plus from their competitors is a focus on putting out very professional products. While they do have drug ID kits that are good for use on the go, they also feature multiple-use vials and bottles of testing solution for numerous tests – perfect for consumers who would like precise, professional-quality drug test equipment. For those who aren’t certain where to buy drug test kits, TestKitPlus has a user-friendly website where customers can easily purchase all of their substance test kits. Alpha-Cat was founded by Sébastien Beguerie, a medical cannabis science expert who has spent over a decade immersed in cannabis-related research and education. Since 2012, he has helped organized an annual international medical cannabis conference in Strasbourg, France. Unlike companies that make drug identification kits for a wide range of substance, Alpha-Cat only focuses on cannabis. 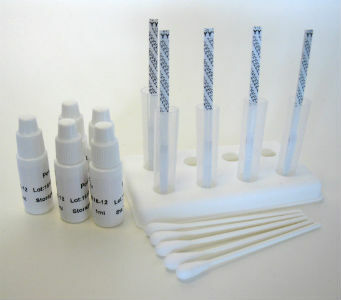 The cannabinoid test kits manufactured by Alpha-Cat confirm the presence of a wide range of cannabinoids. With the cannabis industry quickly expanding, Alpha-Cat products have been integral to helping maintain quality control standards for products around the world. Although they’re simple enough to be used at home by those with no scientific background, Alpha-Cat cannabinoid tests are designed to offer laboratory-level quality and reliability. This makes them ideal for individual consumers as well as businesses that need to ensure the utmost integrity and quality of everything they sell. Cannabinoids are the active ingredients in marijuana, and it’s impossible to know the percentages in a sample without lab testing it. For those who have questions about their cannabis, there are a wide variety of marijuana test kits that can provide answers. 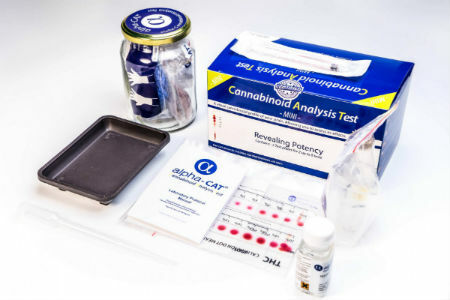 The Alpha-CAT Cannabinoids Testing Kit is one of the most thorough cannabinoid test kits on the market today. While some manufacturers simply provide a yes or no answer to whether or not there is THC in a substance, Alpha-CAT test kits specialize in telling you how much THC is in a substance. Not only that; you’ll be able to determine the levels of other cannabinoids, as well. Alpha-CAT kits give you the option to test for: Cannabidiol (CBD), Cannabinol (CBN), Tetrahydrocannabinol (THC), Tetrahydrocannabivarin (THCV), Cannabigerol (CBG), and Cannabichromene (CBC). Even legal dispensaries make incorrect claims about the makeup of certain strains they’re selling. The truth is that without laboratory testing, they can’t know for sure. With Alpha-CAT cannabinoids test kits, you can. Their two basic kits test for THC and CBD, while their MOBILE LAB Alpha-CAT test for all the cannabinoids listed above. All you need to get started is a sample of cannabis or cannabis-infused products, a well-ventilated working area, and a digital scale. Use the calibration charts from the kit to size up the final color in the test vials to find out what’s inside. Now that we’ve covered the basics of Alpha Cat testing kits, let’s look at each individual kind and why buyers would choose one over the other. As mentioned before, Alpha-CAT is the king of cannabis testing. When you frequently need to test cannabis to rule out synthetics, buying and having an Alpha-CAT on hand is the best way to get fast answers. While they do provide the option of purchasing their MOBILE LAB Alpha-CAT and it is a very cool system, let’s be honest: It’s insanely expensive and gives way more information than the average at-home cannabis tester is looking for. Most folks won’t need more than their Mini Kit (which is good for 2 to 8 tests) or their Regular Kit (which works for 10 to 40 tests). While these two won’t test for the wide range of cannabinoids that the MOBILE LAB Alpha-CAT looks for, they do test for the two most important ones: THC and CBD. Whether you’re looking to regulate your high (either by getting blown sky high or because too much THC makes you feel jittery) or you need a strain that’s truly high in CBD for medical purposes, the two basic tests have you covered. Alpha-CAT testing kits will work on various forms of cannabis, from bud to BHO and resin. All you’ll need to get started is your Alpha-CAT test kit, a sample of cannabis, a digital weighing scale, and a well-ventilated work area. The latter is because the test kits include bottles of chlorinated hydrocarbons. In addition to ensuring that your work area is ventilated, you should be sure to wear the protective gloves included with the kit. Alpha Cat test kits has everything needed to test a sample and decipher the results, from test plates to developing jars, dipping trays, vials, tubes, test fluids, a manual guide and calibration charts. There’s no more reason for guesswork when it comes to knowing exactly what’s in your cannabis. Most drug test manufacturers don’t encourage illicit activity, but are pro-education and pro-safety when it comes to drug consumption. Their goal is simply to provide the information and tools necessary to help people make informed decisions about the substances they put in their bodies. This is why there are test kits available to test a wide variety of drugs, including cocaine. With all of the dangerous substances that are being sold as pure “drugs,” it pays to be educated. Buying a cocaine test kit, for example, is a small investment to make in order to avoid disaster. Cutting agents are all too common in cocaine. One of the most common chemicals used to cut it is benzocaine. This is because it numbs the gums—something that pure cocaine also does. Dealers often cut cocaine with lidocaine to produce the same numbing effect. These are relatively cheap ingredients that can be sold for many, many more times their value when they’re mixed in and sold as “cocaine.” All of this makes it incredibly hard to know if a benzocaine-cut powder is the real deal. Another common cocaine cutting agent to test for is Levamisole. While this ingredient somewhat mimics the effects of cocaine, it’s nasty stuff. For one, it’s a veterinary medicine that’s commonly used to deworm livestock. And then there’s the fact that it can suppress the production of white blood cells and causes skin necrosis. For those who are unfamiliar, that last bit means that it will make you look like a walking, talking zombie. If you have questions about cocaine, a cocaine purity drug test will tell you the content of actual cocaine in a substance. TestKitPlus makes cocaine purity drug test kits that features testing vials in which you combine ampoules of test liquid and a drug sample. The test liquid will change color according to the purity of the substance with which it is mixed. The more intense the color change, the more cocaine is in the sample. They include a chart to help guide you in deciphering the results. 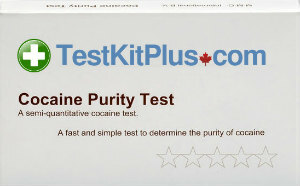 TestKitPlus cocaine purity tests come in 10-packs. Keep in mind that a drug purity test kit doesn’t look for other substances; it’s only testing the purity of the main substance (in this case, cocaine). 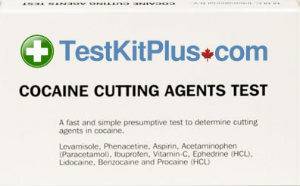 To take your testing one step further, a Cocaine Cuts Test Kit can test your sample for some of the dangerous ingredients (levamisole, phenacetin, and ephedrine) with which cocaine is frequently cut. While the test will not react at all to uncut cocaine, it will change colors if it’s been cut with any of the three aforementioned dangerous ingredients. The test also looks for ingredients such as acetaminophen, vitamin C, ibuprofen, lidocaine, benzocaine, and procaine. For a more basic test to simply determine if any given substance contains cocaine, Test Kit Plus sells kits that test for the presence of cocaine, crack cocaine, 5-MeO MiPT, and MDPV. The liquid in the vial will change colors if the sample you test contains any of the above. 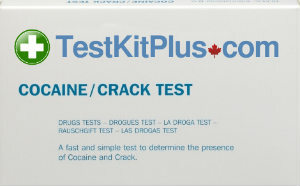 As with their other cocaine tests, the TestKitPlus cocaine cuts and crack/cocaine identification tests come in 10-packs. What about that “ecstasy” pill you’re about to take? MDMA is the active ingredient in ecstasy/Molly. How can you tell if a pill really contains MDMA? And even if it does, how much is in there—was it cut with other synthetic substances? A MDMA/ecstasy test kit can offer quick answers. A lot of the ecstasy on the market today contains DXM, or dextromethorphan. Commonly found in cough suppressant medications, DXM makes people feel woozy and can make them susceptible to heat stroke if they exert themselves too much. Other samples often contain PMA, a toxic chemical that’s much stronger than MDMA and has made headlines after causing numerous deaths. How do you find out if a pill or powder contains anything besides the MDMA you’re expecting? If you’ve been following the thread, here, you already know the only way to find out: buy a pill testing kit! 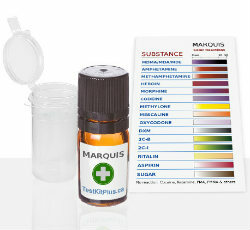 Marquis test kits are designed to give you insight into a full range of substances that a pill or powder could contain. To find out if a pill contains any MDMA at all, try an MDMA/Ecstasy Identification test kit. Test Kit Plus makes a handy test that will turn various colors based on the presence of substances. These tests are great in that they go beyond the simple question of whether or not there is MDMA in the sample; they actually let you know what else is in it, as well. Does your sample contain MDMA, DXM, or amphetamine? Simply put your sample and 1 to 2 drops of testing liquid in the vial and find out in one minute or less. For a more extensive analysis of your substance, check out the in-depth tests offered by Test Kit Plus. Their Ketamine/PMA Test Kit checks for those two substances, as well as heroin, mescaline, codeine, Ritalin, and others. 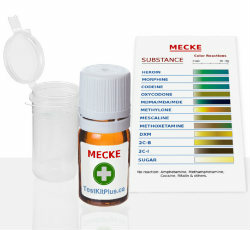 The Opiates (Mecke) Test Kit tests for the presence of opiates like heroin, morphine, and codeine, as well as substances such as DXM and more. It’s always a good idea to use a combination of these reagent test kits in order to get a better idea of exactly what is (and is not) in a drug before it’s ingested. To simply test the purity/concentration of MDMA in a substance TestKitPlus offers a test that changes color according to the amount of MDMA in the sample you provide. Their MDMA (Molly) Purity Test Kit includes enough supplies for 10 tests. 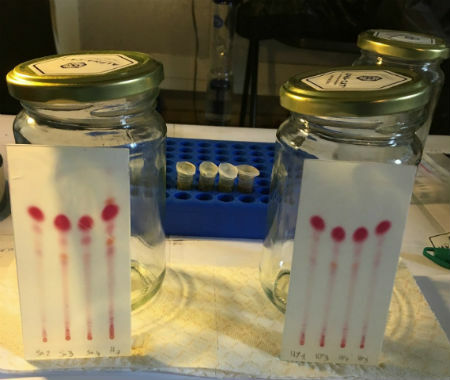 As with their other purity tests, a stronger color change indicates a higher content of MDMA. TestKitPlus MDMA/Ecstasy Purity Test Kit – 10 Tests per Pack. TestKitPlus MDMA/Ecstasy Marquis Test Kit – MDMA/MDA/MDE, (Meth)Amphetamine, 2C-B/C/I/DOB/DOI, DXM, Bath Salts, Opiates & more. 50/100 Tests per Pack. TestKitPlus MDMA/Ecstasy Mecke Test Kit – MDMA/MDA/MDE, DXM, Oxycodone, Opiates & more. 50/100 Tests per Pack. TestKitPlus Folin A/B Test Kit – Differentiate between MDMA, MDA, & MDE. 50/100 Tests per Pack. Should be used after testing with Marquis or Mecke. Once you understand the importance of doing a series of drug tests in order to accurately identify what’s in a substance, it can be an arduous (and expensive) process to acquire all of those individual tests. This is why TestKitPlus offers drug testing kit bundles: it makes ordering the right tests simple and straightforward, and it’s also more cost-effective than purchasing each one individually. Which bundle you need will depend on what kinds of substances you’ll be testing and how deep you’d like to go in terms of getting results. 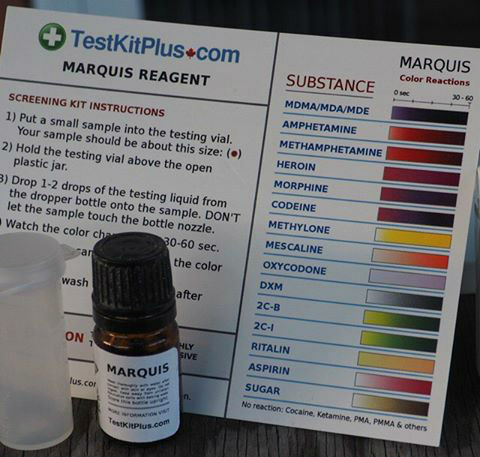 The TestKitsPlus Essential 3-in-1 Drug Test Kit Bundle contains, as its name implies, the three most important tests to conduct on most substances. It features the Mandelin, Marquis, and Mecke tests, color charts to decipher each of them, as well as three separate testing vials. For a more extensive look into the ingredients hiding in a drug, TestKitsPlus offers a Complete 5-in-1 Drug Test Kit Bundle. In addition to the Mandelin, Marquis, and Mecke tests, it contains bottles of fluid to conduct Ehrlich and Folin tests, five testing vials, and color charts for each test. Both bundles come in Regular and Large size options that have enough supplies for 40 to 50 tests or 80 to 100 tests. 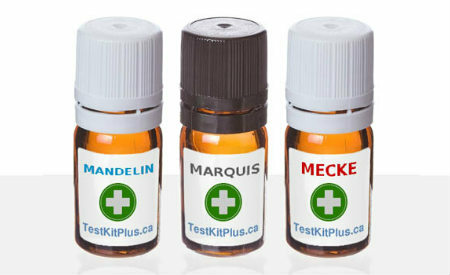 TestKitPlus 3-1 Essential Test Kit Bundle – Mandelin, Mecke & Marquis. 50/100 Tests per Pack. 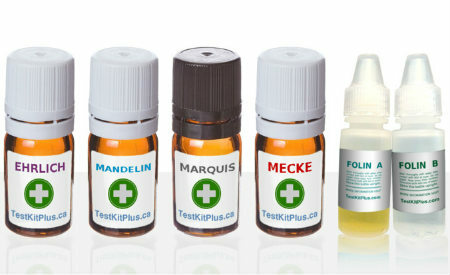 TestKitPlus 5-1 Complete Test Kit Bundle – Ehrlich, Mandelin, Marquis, Mecke & Folin. 50/100 Tests per Pack. The final lineup of test kits available to consumers is LSD drug testing kits. LSD is a tough substance to make, which is why the market is flooded with a lot of fake, synthetic “LSD” products. This can result in people taking dangerous psychedelic amphetamines such as DOB, DOI, 2C-I-NBOMEe and others. Testing can help sort out the real from the fake—potentially saving lives. 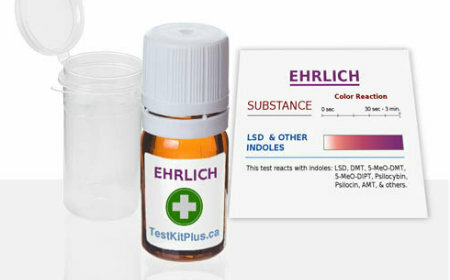 The LSD (Ehrlich) Tests made by TestKitPlus look for the presence of LSD, as well as other indoles such as DMT, 5-MeO-DMT (otherwise known as Foxy Methoxy), 5-Meo-MiPT, 5-MeO-DiPT, Psilocybin, Psilocine, 3-acetoxy-DMT, as well as other ingredients. They can accommodate 40 to 50 tests (for the regular size) or 80 to 100 tests (for the large size). Each kit comes with a multiple-use vial, testing fluid, a color chart, and instructions for the testing. This test will reveal the presence of LSD, DMT, 5-MeO-DMT, 5-MeO-DIPT, Psilocybin, Psilocin, AMT, as well as other ingredients. Authorities and medical personnel around the world are dealing with a sharp increase in the cases of people ingesting drugs that have been cut with fentanyl – an opioid that can cause lethal overdoses in small amounts. Screening substances with a TestKitPlus Fentanyl Test Kit is an excellent way to ensure that a drug is free of this ingredient before ingesting it. The Fentanyl Test Kit from TestKitPlus is 98 percent accurate and can detect fentanyl amounts below 200 billionths of a gram (200 ng). The kit comes with five single-use fentanyl tests that provide a convenient way to test pills, liquids, or powders. The box contains everything necessary to conduct laboratory-quality fentanyl screening, including test tubes, a test tube holder, test strips, swabs, extraction liquid, and detailed instructions. 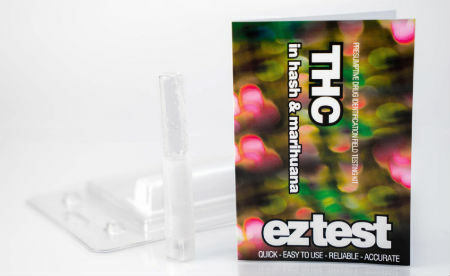 The Cannabis (THC) Testing Kit from EZTestKits is a quick and simple way to confirm the presence (or absence) of THC in a substance. It works for testing products that appear to be marijuana plant material as well as oils and concentrates. Testing is as easy as breaking open the testing ampoule and placing a small amount of the sample inside. With the ampoule recapped, shake it in order to combine the testing fluid with the sample contents. 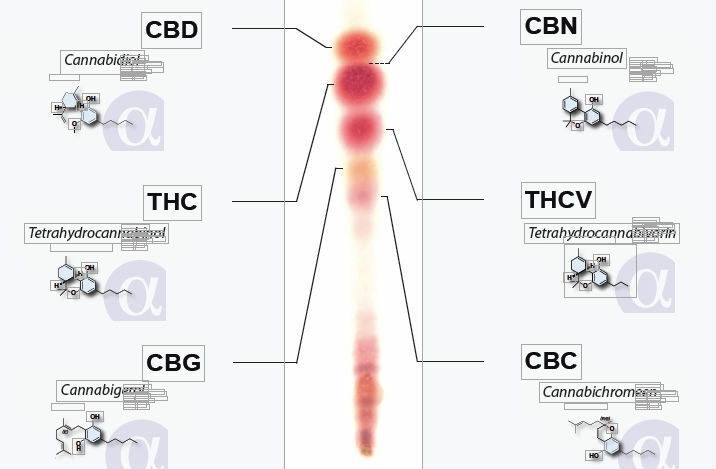 A color change will indicate the presence of THC; refer to the chart included with the kit to decipher the results. 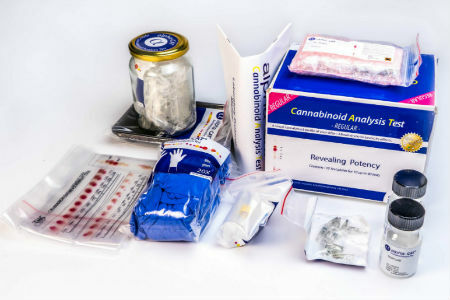 This type of test comes in a Single-Use THC Testing Kit that contains one testing ampoule per box as well as a larger pack that contains 10 THC tests. In addition to ensuring that you’ll always have a THC test kit handy, the 10-pack is more cost effective per test. Don’t forget that a THC Test Kit does not test for potency; it only tests for the presence of THC in a sample. Has your cannabis been mixed with something less desirable? Synthetic cannabinoids mimic the effect of natural cannabinoids. However, synthetics can be stronger (as much as 100 times stronger than THC) and incredibly addictive and dangerous. If natural bud is your thing, you want to stay well away from synthetics—and in 2019, synthetics are everywhere. One need only peruse the day’s headlines to find the latest news of deaths related to synthetic marijuana. People often only think of drug testing in association with pills or powders, but it’s also important to be safe when it comes to consuming marijuana – especially if it was purchased from a dealer. When you want to make sure your cannabis is pure, buying a Synthetic Cannabinoids Identification Test Kit is the only way to be certain. 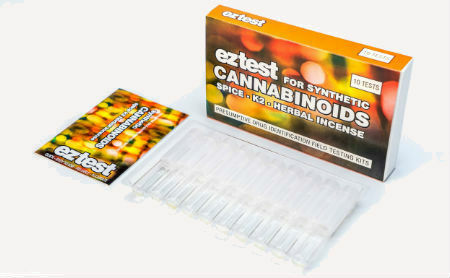 EZ Test Kits provides a way to check for synthetic cannabinoids such as Spice, K2, and herbal incense such as JWH-250 and AM-694, among others. The synthetic cannabinoids drug testing kits are easy to use. Simply pop open the ampoule and drop in a sample of the substance in question. Close it and mix it up. The provided color chart will tell you if the sample contains synthetic cannabinoids. Get a 1-pack test kit to perform occasional tests or a 10-pack if you need to buy in bulk. Benzodiazepines like Valium are some of the most common pharmaceuticals used recreationally. It’s easy to press pills at home, meaning that the market is full of fake benzodiazepines masquerading as the real thing. Dealers are selling fake benzo pills that contain little and sometimes none of the actual substance at all. At best, these imposter pills will have no effect, but at worst, they can contain dangerous drugs such as fentanyl – drugs that can easily cause an overdose in small amounts. 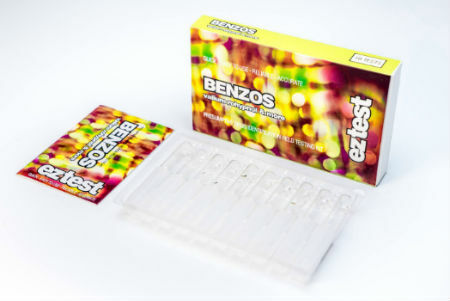 The Benzos Drug Test Kit from EZTestKits helps you quickly determine if a sample contains benzodiazepines such as Valium (diazepam), Rohypnol (Flunitrazepam), Nitrazepam and Flurazepam. One box contains 10 single-use phials, making it easy to always have one on hand whenever you need to verify what’s in an unknown pill. For people who find themselves conducting frequent substance tests, it’s helpful to have the proper equipment. From weighing to careful handling, TestKitPlus has accessories that make the entire process easier from start to finish. 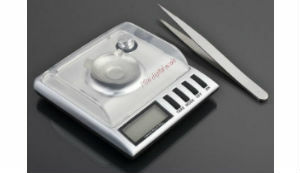 The Mini Digital Scale is helpful in weighing out amounts of samples before testing. This is highly important because having a sample that is too small – or even too large – can result in the test results being inaccurate. The Mini Digital Scale is compact but can weigh up to 20 grams, making it perfect for uses beyond weighing samples for testing. It also has a Tare function that allows you to weigh substances in containers. For conducting multiple tests at once, an Ampoule Holder/Rack helps keep everything upright and well-organized. It can hold up to six ampoules and works with TestKitPlus drug test kit ampoule systems. 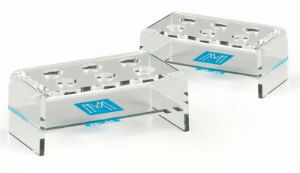 This type of holder is useful for testing several different samples or using and comparing the results of different testing fluids on one sample. It’s also a good idea to stock up on Extra Testing Vials. Each one has a snap lid, and they come in packs of five. As mentioned above, drug test kit manufacturers don’t condone illicit activity. However, people are still going to purchase and use various substances, education and harm reduction are important to keep the public safe. Drug test kits help promote education and (hopefully) safety. Rather than just taking someone’s word that a powder or pill contains a specific active ingredient, they empower you to know what you’re putting in your body. By doing this, you can better avoid having a bad experience or dying as a result of ingesting something dangerous. Buying a drug test kit and keeping one on hand with you is a cheap insurance policy. In recent years, there has been a big push to have drug testing available at music festivals and places where attendees frequently sneak drugs through security. Event organizers are typically frightened of the liability issues that this creates for them and refuse to do anything they see as encouraging drug use. Because of this, it’s up to individuals to be responsible and buy their own drug test kits. Most online headshops don’t sell drug test kits, so the best way to find them is to buy them directly from reputable manufacturers. What if you’ve purchased your drugs legally? Even if you’re legally purchasing cannabis from a local dispensary, buying and properly using drug test kits gives you the ability to know what’s really in them. Has the dispensary lab tested their product to ensure that it’s extremely low (or high) in THC? Is that bud truly a CBD-rich strain? Find out before you continue spending your money with them. 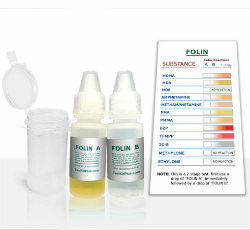 Specific drug test kit manufacturers have become well-known for offering products that are high-quality and reliable. For more professional, laboratory-style drug test kits, TestKitPlus is an excellent choice. Meanwhile, EZTestKits focuses on making drug testing kits that are portable and highly accurate. Both companies ship worldwide, so drug testing is available to you wherever you live. For those who aren’t sure how to test drugs at home, all of the substance testing kits sold by these companies come with easy-to-follow instructions. No matter the substance that’s being tested, buying drug test kits is all about empowering people to make educated choices. And because the tests are accessible, affordable, and easy to use, there’s no reason not to put the power of information squarely in your own hands. For a long time, you could only test drugs if you had access to a laboratory outfitted with the appropriate chemicals. At-home drug test kits have opened up the world of substance testing to anyone with the willingness to spend a few extra dollars and a bit more time to confirm the contents of a pill, powder, or liquid before they (or their friends) ingest it. At-home testing of drugs is relatively new in relation to the drug scene as a whole, however. People who have never used substance testing kits before often have questions about how the whole process works. How reliable are drug test kits? No drug test kit manufacturer can guarantee 100 percent accuracy, which is why it’s essential to buy from reputable manufacturers that make high-quality products. For instance, the fentanyl test kit from TestKitPlus has an accuracy rate of over 98 percent. Is it easy to test drugs myself? For those who are uncertain about how to test drugs at home, most drug test kit manufacturers include easy-to-follow instructions with each of its tests. This means that you can get fast and accurate results with no special scientific training. What’s the difference between a drug ID kit, a drug purity test kit, and a cuts test kit? A drug identification kit gives a basic yes/no answer as to whether a drug is present, while a drug purity test kit tells how much of that drug is present. Meanwhile, cuts test kits look for other substances with which a drug may be cut. Where can I buy a drug testing kit? When it comes to where to buy drug test kits, the most reputable shops are online. You’ll be hard-pressed to find substance test kits at most headshops, and buying online offers the opportunity to read reviews of drug test kit manufacturers and products. What’s the difference between the various drug test kit manufacturers? While manufacturers of substance test kits hope for accuracy, some are focused on portability while others are focused on quality. Read any TestKitPlus review, for example, and you’ll note that their kits are portable but are often multiple-use, laboratory-quality kits while other companies make single-use, throwaway kits. What is a reagent test kit? 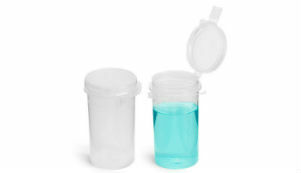 Reagent test kits contain bottles of testing fluid that turn various colors depending on what drugs are detected in a sample. Each type of reagent test looks for a different lineup of substances, which is why it’s important to conduct multiple tests on each sample.